The Columbia Entrepreneurship Design Studio opened its doors in September with a fresh coat of paint, new furniture, and a fully redesigned community space. Add an incredible line up of courses, sprints, and coaching and you have all the ingredients for some unforgettable creative experiences. Sitting in New York City, a global center of design, innovation, and entrepreneurship, Columbia has access to some of the brightest minds and best opportunities to start new ventures. At the Design Studio, we aim to help these innovators, whether they are students, professors, or affiliates, be more human in their approach. How are we doing that? Throughout this semester, we’re running a variety of activities aimed at building the creative confidence and entrepreneurial intent of the Columbia community. Like last year, we’ll be holding monthly intensive design sprints on different aspects of the human-centered design process: user research (in September), prototyping and testing, storytelling, and facilitating creative teams. In these sprints, we dive into specific design skills and encourage participants to “get out of the building” and experience how their solution would work in the real world, with real people. 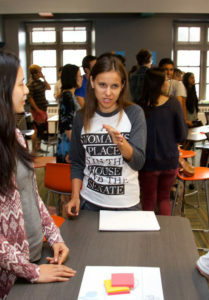 The Design Studio is also co-teaching two experiential courses this semester: Launching Your Venture at the Columbia Business School, and Creating a Social Enterprise at SIPA. 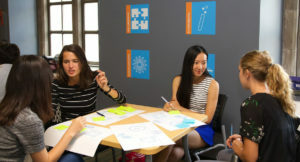 Students in these classes use design thinking and lean startup methodology to identify a problem, better understand their customers, and develop a viable business solution by the end of the semester. Outside of these classes, we’re launching the Design Leaders program to support people who have an idea and want our help to kickstart it into reality. Over the semester, chosen teams will build human-centered ventures through one-on-one guidance, trainings, and team facilitation through the whole design thinking process. This new program will accept a cohort of creative student leaders from all parts of Columbia. Each of these programs is designed to facilitate a culture of creativity and fearless curiosity at Columbia. Our community is key to us, and we hope you will join us in this adventure! See the Columbia Entrepreneurship Calendar for design sprints, studio hours and workshops. Changemakers, Food, and $250K in Awards at #StartupColumbia 2019! PressCan Two Columbia Entrepreneurs Turn Neuroscience into Moneyball?